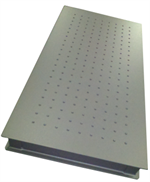 Aluminum Optical Breadboard - 30cm x 90cm x 2.5"
45cm x 120cm x 2.5" Ideal for those quick setups. 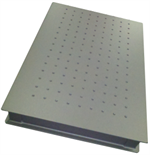 45cm x 60cm x 2.5" Ideal for those quick setups. 45cm x 90cm x 2.5" Ideal for those quick setups. Optical Table Top only. 120cm x 120cm x 4.3". Compatible with all VERE Legs and Table Stands. Optical Table Top only. 120cm x 150cm x 4.5" Aluminum. Compatible with VERE Legs and Table Stands. Compatible with all VERE Legs and Table Stands. 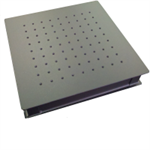 Ferromagnetic Optical Breadboard - 30cm x 30cm x 2.3"